Though Canada enjoys a reputation as a safe country, living in this Great North doesn’t mean leaving your doors unlocked and your valuables in plain sight are recommended habits. Toronto frequently receives global recognition for its safety. In 2015, for example, The Economist named it one of the safest cities in North America and last year the city placed fourth on the Economist Intelligence Unit's Safe City Index. In this post, we’ll go over some theft statistics and give you 5 ways to protect your home from thieves. In Canada’s biggest city, Toronto Police Services compiled statistics on theft, among other crimes. In 2018 so far, Toronto has seen 6,235 break and enters (B&E), which is up 9% from 2017. Generally, Mondays see the most B&Es, followed by Thursdays. Saturdays see the fewest break-in reports. If your home has been broken into before, your home is 12 times more likely to be broken into again. Ground level single-family homes are 15% more likely to be ransacked than apartments, and November (this month!) is the most popular month for these kinds of criminals. In the spirit of Canadian kindness, many homes in “safe” neighbourhoods are often left unlocked, something that police say is an easy opportunity for a criminal. Always make sure to lock up the house and any open windows, your garage, side gate and any other entryways on a routine basis. The first thing a burglar wants is to hide. You can make it harder for thieves to have coverage by making sure your doors and windows can be clearly seen from the street. Trim hedges around windows and main doors so they’re no obscured, install motion-sensor lights to make it obvious when something triggers the sensor, and make sure to report any broken streetlights around your home. Invest in strengthening your defenses, which means improving the condition of locks on your doors and windows. Older homes may not have had their window locks checked for structural integrity, and many victims of theft can attest to having their older window and door locks manipulated. A solid deadbolt is old-fashioned but time-honoured. 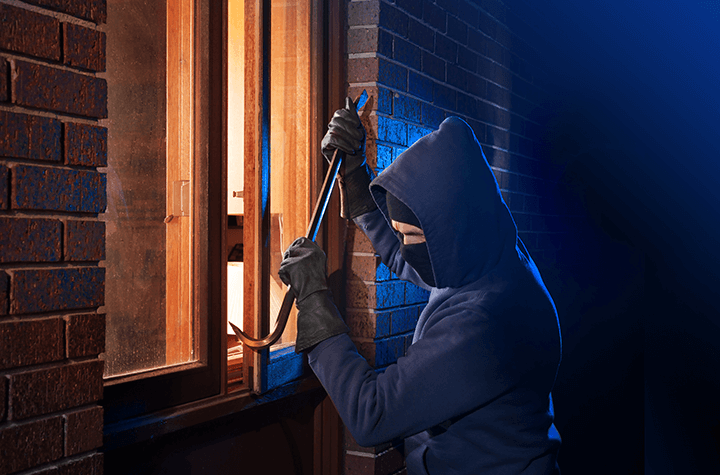 It’s not just the main home that a thief will try to break into, garages, garden sheds, pool houses, backyards and cars are all potential targets, especially since they can provide tools needed to help burglars gain access to the main home. In Australia, trash bins have been thrown through windows to break and enter. Use keyed U-locks and motion-sensor lights on exterior targets to keep potential aides out of reach. If you’re on holiday, have a friend or neighbour pick up your mail so it doesn’t pile up. Further, have a neighbour park in your driveway while you’re away. Lights and radios set on timers can also act as a deterrent to thieves as it gives off the impression that your home is in fact, occupied. Having a home security system can also lower your home insurance premium. As it should go without saying, keep valuables out of sight from windows, draw your curtains, install alarms, bring a guard doggie into the family if it’s feasible and reach out to your neighbours so you can have a close point of contact.